Realistic Snowflakes by Laurence "GreenReaper" Parry - images by PixelPirate - Link Bring the winter snows to your desktop! Features hundreds of swaying, wind-swept flakes floating in the background. 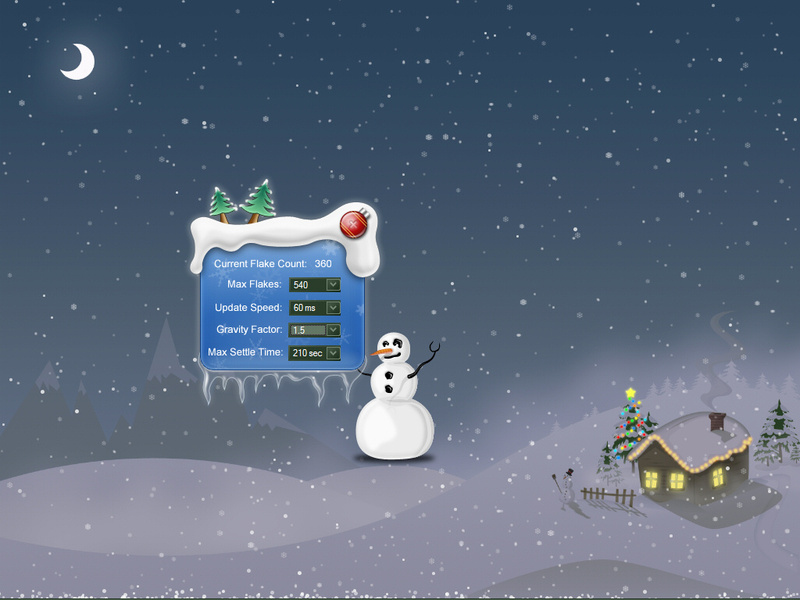 Click the snowman to change user options, which include maximum number of flakes (actual count is balanced for idle CPU use), flake interval (lower = faster), gravity and settle time on the bottom of your screen. Try the flakes out today - no need to wait for Christmas! * READ ALSO: This does not occur on all machines, but if you find DesktopX's user interface freezes up above a certain number of flakes, please terminate DesktopX via Task Manager (Ctrl+Alt+Del/Processes tab/right-click DesktopX.exe/End Process) and restart with a lower value for Max Flakes - it should restart with the previous session's settings, not the ones that locked up. This should not affect other programs, only DesktopX. Make sure you have the very latest version of DesktopX available as future updates may fix this. Having said the above, do experiment with the settings to find the best level for your computer - the initial settings are conservative, particularly the Max Flake count. The snowflake script will automatically compensate for CPU usage by other programs by removing snowflakes when CPU use is high, and adding them back when it is low - you should be able to run this object in the background without trouble, although you might want to set it to 0 flakes while gaming. Flakes are customizable - just clone another OriginalFlake or replace existing images. Text works too, try some floating Wingdings! You may also tweak certain variables in the script - see script comments. Many thanks to PixelPirate for creating the snowman and settings dialog images for this - all rights are reserved for these. You may use this script in your own objects as long as they are free to download - edit the snowman's script for details. this is just 2 cool !! Yes, just click the snowman to access the settings pane. Really nice work - thanks. Excellent piece of programming and artisty rolled into one dx pack. I've had negligle impact on CPU useage too. Thank you both! I did try to have it avoid getting in the way as much as possible - I use my computer to work, and I assume others do too; it's just not a good idea for it to be soaking up CPU time in the background if that time is needed by anything. Leaves a bad impression of DesktopX. Is there anyway I, (as a non programmer) can reduce the size of the snowman or even make him invisible. mark: If you want him invisible, just right-click the snowman and click Properties, then go to the Relation tab and select Visible: No . . . and DesktopX crashes. OK. Right-click and disable the script first, then go into properties and set the visibility. You should find some script popups occur, just select Enable on all of them. Then it should work. If it doesn't, try right-clicking DesktopX, selecting List Objects, then right-click the GR_Snow_Controller and enable the script. You would also have to edit it there to make it visible if you want to change the options (or delete and re-import, or start a new theme, or edit the DXLocal file manually in your theme directory). You could alternatively change the opacity in States tab/Transparency/Uniform opacity. Frogboy, bbnn: Thanks! And bbnn, you could use it in autumn if you wanted, just change the flakes to leaves. Whoops, I seem to have broken WC's comment system as well - can't edit that post either. I'm having a good bug-finding night tonight! Edit: Fixed by Jafo. Yay for Jafo! Excellent! Runs so smooth and the feeling of snow is just right! GreenReaper! it's always so much fun to see other programmers that just do stuff for a challange and fun! I am also the type of person that likes fancy algorithmic stuff and really enjoyed your snowflakes article as well as the flakes themselves. Hope to see more stuff from you soon... How about some leaf simulation or grass field with grass blades bending in the wind? MERRY CHRISTMAS TO ALL OF YOU ON WINCUSTOMIZE.COM! Secondly, if you think the snowman is just a bit too big or obtrusive, try changing the graphic to one of the bigger snowflakes that is part of the Snowflake object that comes with DX. I choose Snowflake(7).png. You really need an icon to make it easier to delete or configure, and a slightly different snowflake works well.